There is a saying that 'we are what we eat'. Consumers are awakening to the realization that the food they eat is highly processed, contaminated sometimes with pesticides and other times with high levels of growth hormones. The agri-business-grocery complex has put profits before the welfare of the consumer. Almost as disappointing, the modern agri-business-grocery complex has produced profits in a way that is unsustainable for our environment. NaturalWorldWideWeb seeks to connect you to more healthy foods, produced in a more sustainable manner. 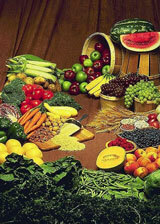 Mayo Clinic Diet which focuses on lifestyle changes. The goal of the diet is to assist individuals in achieving and then maintaining their optimal weight. It includes four areas: eating right, incorporating physical activity, setting action goals, and staying motivated. http://www.mayoclinic.com/health/mayo-clinic-diet/MY01646.